The Nature Conservancy-funded program will test how new hook designs and other practices could reduce bycatch while keeping the fishing business lucrative. Within seconds of being hauled onto the Shen Lain Cheng, a 79-foot tuna fishing boat from China, the crew’s most senior member, whose deeply wrinkled face conveys more than his 58 years, is plunging a T-handled spike between the glistening eyes of a 100-lb yellowfin tuna. The hope is that the swift death has minimized the release of lactic acid, which degrades the flesh meat and reduces the crew’s chances of earning a grade-A for this fish once it is offloaded back at port in Koror, Palau, a small island nation in the Pacific Ocean. He quickly eviscerates the taut, silvery fish, pulling out an assembly of organs that look like something from another planet. He removes the heart and stomach – the scavenged parts that will likely go into tonight’s crew dinner – and tosses the rest of the guts overboard before flushing the carcass with running water, sewing up its gaping mouth, and placing it into the icy waters of the boat’s cold storage tank. If the buyers back in Koror, who inspect and score the quality of each tuna’s meat, give it a high grade, this particular tuna could net around $2,800 wholesale in Japan, where it will be resold at great profit in a sushi restaurant. It all looks like a typical day of tuna wrangling on the high seas, except that it’s not. Aboard are Lotus Vermeer, who manages the Pacific tuna program for The Nature Conservancy (TNC), a US-based environmental organization. 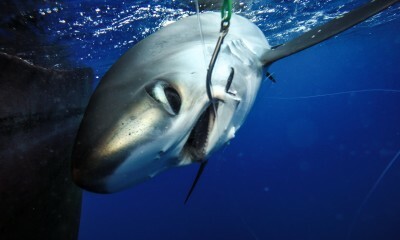 Also aboard are Michael Musyl, principal scientist of the Pelagic Research Group in Hawaii and a shark expert, and Ivan Sesebo, a tuna fishery observer, who works for an auditor hired by the boat’s owner, Hong Kong-based Luen Thai Fishing Ventures, to ensure compliance with fishing regulations. Read the full story, and see a photo gallery, here.